BCCI is expected to announce India’s World Cup squad led by Virat Kohli on April 15 in Mumbai. With just a couple of days to go in the announcement of India’s 15-member squad for the upcoming ICC World Cup 2019 – Virender Sehwag has named his top picks for the showpiece event, scheduled to be played in England and Wales. The final round of auditions are almost done and dusted in the ongoing Indian Premier League (IPL). The onus is now on the selectors to pick the best team who will look to put their best foot forward and look to win the title for the third time. As per the roster, BCCI is expected to announce India’s squad led by Virat Kohli on April 15. It will not be an easy task for the world’s richest cricket board as they have to make quite a few tough decisions for a couple of spots. 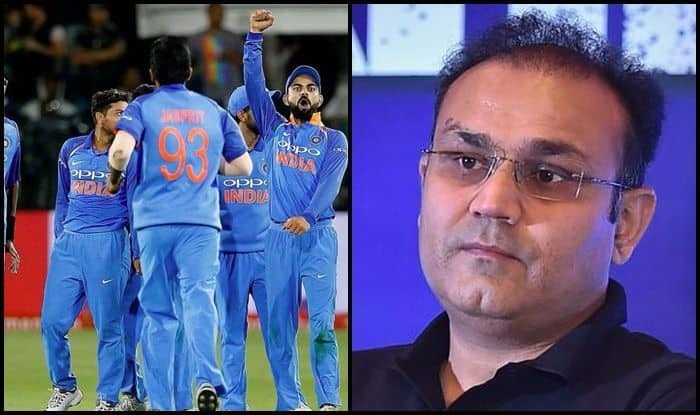 In Sehwag’s squad there are quite a few common names, who were already expected to make the final cut- Virat Kohli, Rohit Sharma, Shikhar Dhawan, MS Dhoni, Jasprit Bumrah, Bhuvneshwar Kumar and Hardik Pandya. But, there are a few interesting choices as well made by the ‘Nawab of Najafgarh’ which will definitely raise a few eyebrows among his fans. Earlier, Sehwag said at an event that a cricket match between India and Pakistan is nothing less than war. India and Pakistan are scheduled to lock horns in a World Cup round-robin match on 16 June. There have been calls for the India team to boycott the match against Pakistan from several fans and former cricketers following February’s militant attack in Pulwama. Sehwag’s erstwhile opening partner Gautam Gambhir was one of the voices to have said that there would be nothing wrong if India forfeited the Pakistan match. “There is another point that is discussed. We should do whatever is good for the country’s welfare. When India and Pakistan play a match, it is nothing less than a war. We should win the war, not lose it,” he told reporters.